Dumna Nature Reserve: Dumna Nature Reserve Park is an ecotourism site open to the public located in the Jabalpur district of the Indian state of Madhya Pradesh. The site is suitable for nature walks during which many wild animals like deer, Chitals, wild boar, porcupine, jackals, monkeyand many other species of birds are visible along the way. Dhuandhar Falls: The Dhuandhar Falls (धुआंधार) is a waterfall in Jabalpur district in the Indian state of Madhya Pradesh. ‘Dhuan’ means smoke. The mist created by water falling on hard rock creates visuals of smoke emanating from the river bed Hence it is called Dhuandhar or Smoke Cascade. The white water pummels down to form a gorge known as the Marble Rocks. Madan Mahal : Madan Mahal Fort, a construction belonging to the 11th century, is a stunning example of the architectural splendor of the past. it was built and it served the purpose. Constructed by Madan Shah, son of Rani Durgavati, a Gond ruler, the fort served as a watch tower during the reign of the queen. The fort does not share the likes of other forts in the country. Balancing Rocks: Balancing Rock, which is a huge rock on a small base. The precarious position of the rock makes you doubt your eyes. he rock had not shifted even when there was an earthquake of 6.5 magnitudes. Geologists state that the rocks are one and not two. It is said that it was one sandstone rock dating back to millions of years. Bargi Dam: Bargi Dam is situated about 40 kms from Jabalpur Boat ride here is a pleasant experience. Make sure you are here in the evening to watch the sunset It is a perfect place to relax and enjoy the gentle breeze as your eyes savor the picturesque setting. Bastar Palace: Bastar Palace, also called as Jagdalpur Palace is one of the most frequented tourist destinations in Jabalpur. The carvings on the walls and ceilings are exquisite. The palace is surrounded by lush gardens. 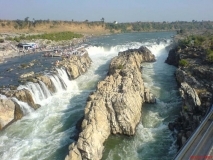 Jabalpur is one of the Famous and big city which is famous for shops and Bazzars. Jabalpur is well known for its exquisite fabrics and state of the art crafts. The Bazaars in Jabalpur provide quite interesting and exciting experiences for the tourists. Jabalpur in madhya pradesh is ideal to buy rare artifacts and antique objects. Shopping in Jabalpur is an good experience for you.